ABEERDEN, S.D. – The Southwest Minnesota State softball team (11-17, 6-10 NSIC) was swept by Northern State (15-23, 7-9 NSIC) Sunday after a 4-0 shutout in game two following NSU’s 5-4 victory in game one at Presentation College Dome in Aberdeen, S.D. The Wolves hit two solo home runs in the top of the first inning to gain an early lead over SMSU in the 5-4. The Wolves advanced their lead to a 5-0 gap in the top of the fourth off three hits and one error on the Mustangs. The Mustangs attempted to rally in the bottom of the fourth scoring four runs off two hits and one error. SMSU earned their four runs with two outs after the first two batters struck out. Abbie Decker was the first to reach the bases in the inning on a fielding error. Kali Tomlinson followed with a double to right field to advance Decker to third. Alex Reak and Kaylee Hentges both walked to score Decker and loaded the bases once again. Madison Krog took to the plate to single in right to bring in Reak and Tomlinson. The Mustangs brought in their final runner as Hentges came in on a wild pitch. Megan Cull started in the circle to throw four innings and four strikeouts. Shelby Crank went to the circle in the fifth to throw three innings of relief with three strikeouts. The Mustangs were led on offense by Tomlinson who went 2-of-3 at the plate. SMSU suffered its fifth shutout of the season as NSU out-hit the Mustangs 10-4. The first inning was scoreless until Northern State broke it open in the top of the second as the Wolves strung together three hits for two runs. NSU stranded eight runners on base in their 10-hit game, while SMSU stranded seven. The next two innings were scoreless until NSU had a one-run inning in both the fifth and sixth to secure the four-run lead. 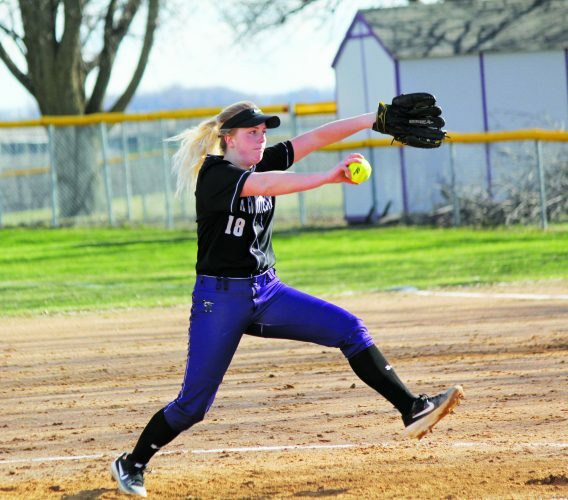 Athena Golling tossed all seven innings with two strikeouts. Southwest Minnesota State continues action today for a 2 and 4 p.m. doubleheader versus MSU Moorhead at Scheels Field at Nemzek Stadium in Moorhead.